From time to time my family and I go out to eat at The Mandarin, a child-friendly restaurant that serves a buffet. Many of the dishes served are influenced by Chinese cuisine, as is the decoration. One of the Chinese characteristics found at this place is the fish pond that has been placed at the entrance (this is to ensure good luck and fortune). When looking at the fish pond, one notices the goldfish swimming quite happily in their space. What is amusing, though, is the sign that has been put up warning people not to throw pennies into the water. This may no longer be a problem as pennies are being discontinued!. I wonder whether the sign works, or if the workers have to fish for copper coins at the end of their shift. 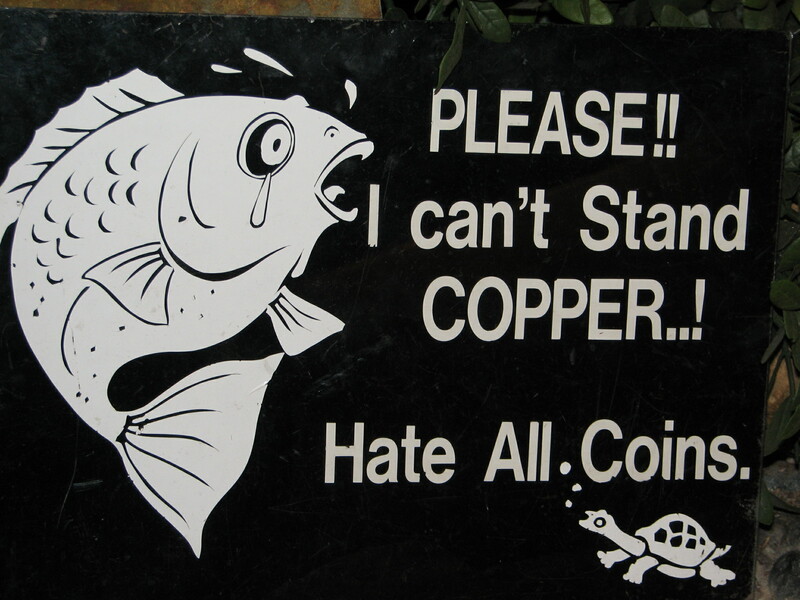 Do you throw copper coins into fish ponds for luck? Rarely, but if there was a pond that was really special then I would do it. I never thought that it would affect the fish, and now would definitely would be more aware of that situation…. I did not realise it either. Makes sense though once you think about it. It’s not only pennies which are a problem, at least not with U.S coins. (Not sure about the Canadian coins.) All U.S. coins contain copper. For example, nickels are 75% copper. That could be why the sign also says ‘hate all coins’. In general, metal doesn’t belong in a fish tank or fountain. I’ve read that aluminum may be ok though. Now that I did not know Alex. Thanks for the info. Oh I know this rule Colline, but am more upset about the loss of the penny. (here in Canada, I still have my pennies in England) How are we ever going to change the find a penny, pick it up rhyme to nickels, dimes or quarters? 😦 Not quite the same, is it? No it isn’t. Last month I was teaching my class how to add coins (the penny being among them) and realised that in a few years the 6 year olds will not even know what a penny is! I know! It’s like my old Bakelite rotary phones. When I got the adapters and plugged them into the phone line my 21yr old had no idea what to do!!! So funny. No wonder there is a generation gap – our experiences are so different from theirs. My children have spent quite a long time watching them – they love the fish pond. Never in a fish pond but always in a fountain! As I have. Did not know people threw coins into fish ponds until I saw this sign. Just shows how dangerous money is! Actually, it is high time all currencies were revalued to bring them back to sensible levels where one could actually buy something for a penny and not have to start in large numbers. I think this would be a better plan than getting rid of the lower cents. I still remember a time when we used to buy Chappies for 1/2 cent. I never even think of throwing coins into a fish pond….hmmmmmmm.. Neither would I. One would think the pennies would be saved for throwing down a wishing well, or in a fountain. Yes, I always think of a fountain…not someplace where things are living.. I think those are Koi fish, a family of carp. I used to have them in our small pond but they all died during the flood three years ago. Yes they are. 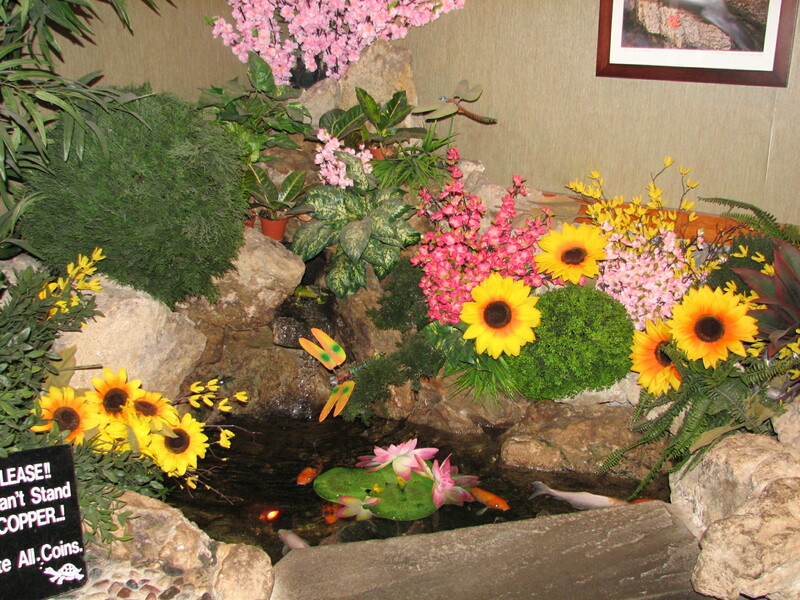 According to Feng Shui, there should be 9 in the pond to bring good luck and fortune. I agree. 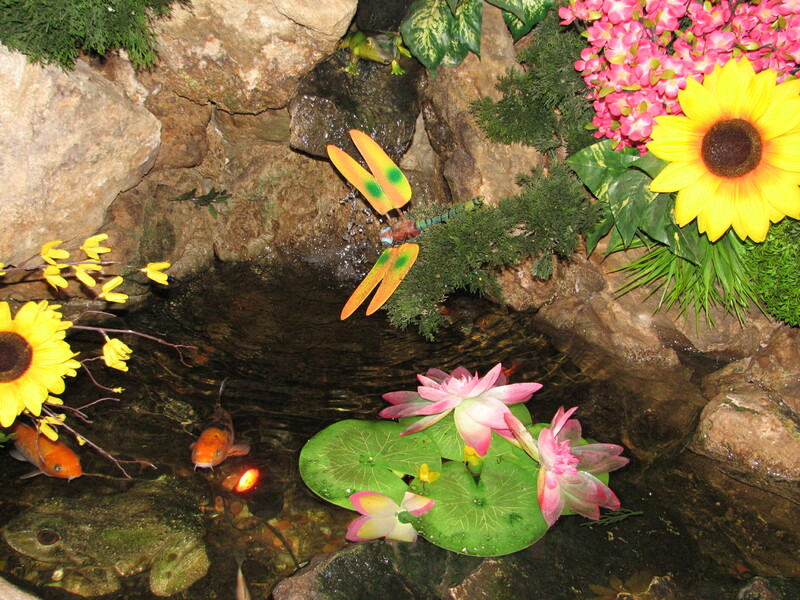 And the pond at the restaurant is quite beautiful. An interesting sign Colline, have never heard of it before. Neither has I Ian until we walked into this restaurant for the first time. They must have had some fish die in the past. Great post Colline, funny AND informative!